In MCPc Inc. v. NLRB, 2016, --- F.3d ---, Case Nos. 14-1379 and 14-1731 (3d Cir. Feb. 12, 2016), the United States Court of Appeals for the Third Circuit affirmed the Board’s determination that an individual employee engaged in protected concerted activity when he complained about shared work conditions to a member of management, in the presence of other employees during a “team building” lunch; but remanded the case for further proceedings because the Board failed to apply the correct legal test (Wright Line) for determining whether the employee was discharged for that protected activity or whether he was discharged for his alleged misconduct, irrespective of any protected activity. The Court also found that the company violated the NLRA by maintaining an "overly broad" confidentiality policy. The case arose when a senior solutions architect (employee) of MCPc (Employer) complained to management in a “team building” lunch about his and fellow employees workloads, as well as the need need to hire more staff. The employee further expressed how the salary ($400,000) paid to a recently hired executive could have been used to mitigate their workloads. After the employee raised those concerns, his coworkers joined the discussion and expressed agreement. A week later, the Employer questioned the employee about how he had obtained the confidential salary information he mentioned at the lunch. The employee’s responses were inconsistent and not candid. The Employer terminated the employee for improperly accessing and disclosing confidential salary information and dishonesty. Following his discharged, the employee filed a complaint with the NLRB. The general counsel argued that the employee’s complaints about work load and executive pay (workplace conditions) were protected concerted activity. The Board found that MCPc, Inc. violated the Act for discharging the employee based on his complaints about workplace conditions. In finding his discharge unlawful, the Board rejected the Employer’s claim that it discharged him for improperly accessing an executive’s confidential salary information from the company personnel system and disclosing it during the group meeting, because the alleged misconduct did not, in fact, occur. The Board did not comment on the additional claim that the Employer discharged him for lying when MCPc questioned how he obtained the information. MCPc, Inc. appealed the decision and order of the NLRB holding that MCPc violated the Act by discharging an employee for concerted activity, and the Board cross-appealed for enforcement of its order. Wright Line - The Court found the employee’s misconduct did not take place during his protected discussion with management. As such, the Burnap & Sims test used by the Board and ALJ did not apply. The Burnap & Sims test applies to misconduct “arising out of” protected activity and misconduct occurring “in the course of” protected activity. See NLRB v. Burnap & Sims, 379 U.S. 21 (1964). The court held that the "mixed motive" or "dual motive" discharge test of Wright Line, 251 N.L.R.B. 1083 (1980) is the appropriate test for determining whether an employee is discharged for engaging in protected concerted activity unrelated to his/her protected activity. The court further noted that, while the Board may have meant to invoke Wright Line as the appropriate test, it did not note the applicability of Wright Line or apply it in the case. Accordingly the Court remanded the case to the Board for application of the correct test. Under Wright Line, the General Counsel must demonstrate that protected activity was a “motivating factor” in an employer’s challenged action. Molon Motor & Coil Corp. v. NLRB, 965 F.2d 523 (7th Cir. 1992); Wright Line, 251 NLRB at 1089 (1980). To carry this burden, the General Counsel must demonstrate that the employee was engaged in protected activity, the employer had knowledge of that activity, and the employer bore animus toward that activity. Once the General Counsel establishes a prima facie case, the burden then shifts to the employer to show by a preponderance of the evidence that it would have taken the same action even absent the prohibited motivation. If unable to make this showing, the employer is in violation of Section 8(a)(1). Wright Line, 251 NLRB at 1089. Confidentiality Policy - The Court found that the company violated the NLRA by maintaining an "overly broad" confidentiality policy. MCPc's confidentiality policy stated that "dissemination of confidential information within, such as personal or financial information, etc., will subject the responsible employee to disciplinary action or possible termination." The activity of a lone employee can constitute “concerted activity” where the individual employees seek to initiate or to induce or to prepare for group action;" and where the "individual employee truly brings group complaints to the attention of management." The "dual motive" discharge test established in Wright Line is the appropriate test where an employer argues that it discharged an employee for reasons unrelated to his/her protected activity. Employers should continually review their Employee handbooks to ensure their policies are not over-broad and infringe on employee rights protected by the NLRA. 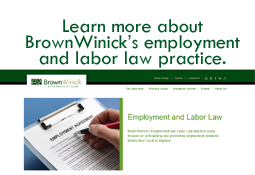 Should you have any questions about the NLRA and protected concerted activity or Employee handbooks, contact your own legal counsel or any of our Employment & Labor Law Practice Group members. Should We Fire Him for That Post?